How Powerful is Video as a Marketing Tool Anyway? Everywhere we look nowadays we see video pushed as a growing marketing tool. Pushed so much, in fact, that it seems like video must be imbued with superpowers. Is video really that great of a way to reach potential clients? Or are the ones pushing it simply video service companies and videographers looking for a potential gig? Those are some serious numbers! On Facebook alone, there are over a half a billion people watching video every single day. Whether you are a large company or a small family-owned venture, don’t ignore the power of video. Make some room for short branded videos in your budget and use them to stand out in your social medial marketing. When people think about hiring someone to shoot professional video for them, oftentimes their primary concern is money. Nothing wrong with that—anyone in business knows they need to make sound financial decisions with their income. You’re a sensible business with a good-quality service or product. Whether you’re non-profit or for-profit, you believe in what you do. Here’s a secret to professional video—a little more goes a long, long way toward making a good impression. Recently, Clear Summit Productions did a publicity video for Vista Ridge Academy. Vista Ridge is a non-profit school, so their advertising budget isn’t huge, but they wanted their finished product to convey the dedication to quality that is one of their pillars of operation. How did they do that without breaking the bank? Simple—they allowed CSP more than bare-minimum time to get the job done. The ability to add technically interesting video footage to the video. Extra interview footage allowed them to select only the very best footage to support their cause and discard the rest. And the time lapse and aerial segments we created fill the piece out and give it a more robust feel and look. All of which comes together into a more professional end product that better reflects the quality the client was trying to show. Let’s be honest here, CSP could have shot this job in one day. We could have edited it together nicely and still produced a respectable piece of professional video work. BUT…the extra time this client gave us allowed us to schedule more interviews with people who couldn’t all make the same day, and add some extra touches to the finished piece. This client stretched their dollars by purchasing more time and dividing their shoot time into half-days. This allowed them to pre-produce smaller segments at a time, at a higher level of preparation, with higher quality results. It also allowed CSP to focus on a smaller shot list at each scheduled shoot, which in turn allowed us to use more interesting shots. The price point for these extras is no higher than the cost of the videographer’s time, and isn’t as daunting of a difference as you think. So next time you’re purchasing professional video, go ahead and dream a little bigger. Say things like, “I have this idea—tell me what this would mean in terms of cost on your end.” Ask those questions and get the facts. You’ll probably be pleasantly surprised at how affordable the extras are. 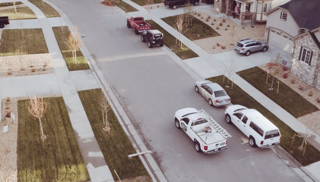 Recently, Clear Summit Productions, a drone videography company based right here in Lakewood, Colorado, completed a video ad for Denver roofing powerhouse, d7. d7 is a very successful company that has been in business for over 20 years. They have offices across several states and handle roofing jobs of all sizes with high quality work, certified crews, and tight price quotes that they honor. We here at Clear Summit are very proud of the video we produced for them. I mean, look at it. All that soaring aerial camera work, snappy ground footage, and crisp graphics… It’s beautiful! This ad is an example of a video that we produced exclusively. Everything was done in-house. Talent casting, scripting, shooting, scheduling, music, voice-over, etc. If you’re a hands-off client who wants to sit back and let us do the work, only stepping in to give approval/disapproval at critical points in the process of video development, we can work with you easily, just as we did here. On the other hand, maybe you’re a client who would much rather take part in the creative process. Maybe you want your words to be the script, your staff to be the ones filmed, or maybe you’d rather handle the scheduling and music choices yourself. Whatever the reasoning and whatever the level of involvement you prefer, Clear Summit can and will work with you. We’ve done projects with all levels of client involvement and if we may be perfectly frank, we have the skills to make your project look good no matter what. In a win-win scenario, our client comes out the finishing end of a Clear Summit gig happy. They have a product that represents their company well and that will capture the attention of their intended market. And we come out of that same project proud of our work. We’ve made something that looks good and sounds good, and we have a happy client. We really aren’t too worried about the process by which we get to that win-win end point. We’re flexible in engagement style, but own the technology and have the skills necessary to produce high-quality work in just about any setting. We’re happy to do the heaving lifting for you, or we’re happy to hand parts of the work off to you to manage yourself. We like to make sure the client is comfortable, and that means us being involved as much or as little as you want. Yes, we can do it all. But we don’t need to in order to make sure your project ends up just how you want it. Recently I got the opportunity to help out a friend of mine and his wife with a promotional video for her Photography company. She is transitioning to more of a wedding photographer and really wanted to highlight the advantages of going with Her and Her Husband as your wedding photographer. It was a ton of fun to shoot, and a type of video I have been wanting to for awhile now. 95th Annual Greeley Stampede video! This video was shot to promote the Greeley Stampede in their 95 year celebration. We had a ton of fun working with the people at the Stampede and highly recommend heading over there this 4th of July to enjoy the biggest 4th of July Rodeo in the United States. This series of commercials for Greeley Unexpected was shot last summer for the 2016 campaign and we are excited to share it with you guys now! Video project for Colorado Advanced Industries Grant Video. This spring, Clear Summit Productions shot a series of videos for the Greeley Unexpected 2015 campaign. We are really proud of them, and hope everyone digs them as much as we do!